They have 1 month to respond or they will have to give you a reasonable timeframe where they have to respond by within the 1 month before you can go to ICO. 1. Does this only affect MPO / AM members / registered account members or are guests affected? 2. Only revenue fares or AM /redemptions or both? I find it impossible to trust anything CX says on this. I also must be careful as data is my business, not IT, but information for Capital Markets. While the above is rather negative, those losing higher risk data will need to think about impacts. Experian can only do so much. And comparing to BA, they had 400K customers details taken, CX lost 9 Million more or 23.5 times more. Impressive in its negligence. Mr. Strong, kaka, G-CIVC and 3 others like this. Similar here, my last was in 2013. They got my address, email, name, and title. Travel document was stored. Cathay is directing questions to an unverified twitter account. What a clown show. I have not received an email yet relating to my own data. Neither of us are MP, but both have an AM account. What MP status are you? My wife is at gold and parents are at silver but neither of them received the email. Wonder if they are they really sending emails out according to MP levels? lol. 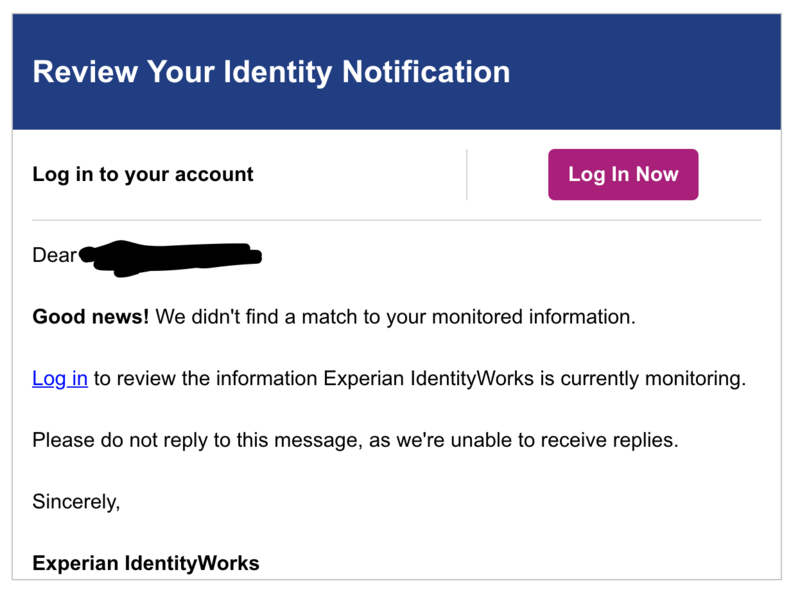 Anyone subscribing to their identity monitoring service with experian? Wonder if it's effective or more giving your personal data to another 3rd party. yes a bit wary of it too. but gave it my email addresses, credit card number, etc. since my data is out there anyway. and got back the attached basically right away. not sure if how much of the "dark web" it can scan. just hope experian itself doesnt get hacked. Guys, I doubt status has anything to do with when you're getting it. It's just a matter of how the query is run and when they load the mail server to send it out. Something to keep in mind. By accepting their identity theft protection, you could possibly by absolving CX of any responsibility they have to you. If you do want to be compensated somehow, you should read the T&Cs before accepting their identity theft protection. To those that have received the emailed notification, can one of you confirm if it comes from the same Marco Polo email address? I want to make sure my spam filters whitelist the address if it is something different. Surprisingly calm when reading this. Prob becoz my name, address, ID bla bla bla were already leaked when HK gov lost the computer containing all HK voter's information. Not particularly crossed if/when CX leaked those again. But why do they announce this 5 months after confirming such incident? In March, It still kind of reasonable not to announce to the public when they 'suspected' such leakage. It is hard to see any legitimate reason to remain silence for 5 months after knowing such colossal data leakage.